A few weeks ago I decided to get a real body composition test done. The last time I had a body fat test was in my second year of university, done for free by a kinesiology student with some calipers. I think I got 8.9% or something stupid like that, likely because calipers are really inaccurate. 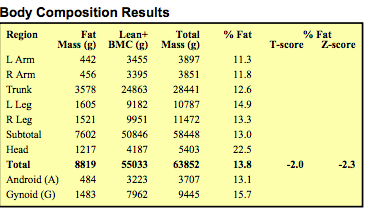 There are a number of reasons I felt now was a good time to get a body fat measurement done. The first is my age. I'm turning 32 soon and I'm now reaching an age where my metabolism will start to slow and I'll have less muscle and bone density relative to my fat. But I've also been doing a lot of "body hacking" (for lack of a better term) of late. I've been eating paleo/primal for well over a year, mixing in a little intermittent fasting, trying to sleep a bit better, taking my vitamin D and fish oil -- in short, trying to do all the little things right. To be honest, probably the least healthy part of my life is the part that people think makes me healthy: the fighting. A late-night 3-hour high-intensity session is actually pretty rough on the adrenals, will result in some level of chronic inflammation, and really just not generally ideal. But I love the sport and so to me it's worth it. In any case, I figure that the result I get now is probably going to be the best result I get going forward. There are probably some modest improvements I could make in my lifestyle, but I suspect I can't improve my "score" very much, considering the effects of age. So after some research, I found that the two most accurate, reliable and consistent methods of body composition measurement were the "BodPod", which is an air displacement method, and DEXA (Dual Energy X-ray Absorptiometry). There was a DEXA lab called Bodycomp Imaging very close to my home, so I decided to give it a try. Despite me being less than impressed with the 13.8% number, Peter, the guy running the DEXA machine, was very impressed with it. I felt a little better when he said that many of the Vancouver Canucks players come in around 12%. I suppose when I consider that I'm not a professional athlete, not exactly a genetic freak and also that I have never used any sort of "assistance" (ahem), I can be a little prouder of 13.8%. But in the end, the absolute number doesn't matter much; it's the relative number that matters. Now I have a number, and so as I age, I will try to not get too much worse than 13.8% using DEXA. As you can see, my left arm has (slightly) more muscle and less fat than my right arm, which Peter says is extremely rare in right-handed people. Maybe it is more common in fighters because we use our left more frequently in throwing jabs. My right leg being more muscular than my left makes sense in a fighting context too, since in an MMA stance you have more weight on your back leg. Nevertheless that level of asymmetry is probably a slight concern. I was amused that my head is 22.5% fat. Feel free to refer to me as "fathead", since it is technically accurate. My bone density scores were good but not great for an athlete, according to Peter. While my body fat is 2 standard deviations below the average North American male, I'm only 0.5 sigmas north of average for bone density. Peter said he would like to see that higher, but that it should improve with consistent Vitamin D supplementation. Also with my MMA workload being what it is, I rarely lift weights -- something like once a month -- so I suspect improving that would help a bit. In any case, I learned a lot about my body, and most importantly, established a baseline that I can try to improve or maintain. For people who are concerned about fitness, I strongly recommend getting a body composition test done. I see many people (especially girls) on Facebook/Twitter/etc feed worrying about their weight when they should be worrying about their body composition. After all, you don't really want to lose weight, you want to lose fat. If you're in Vancouver, I definitely recommend Peter at Bodycomp Imaging. He's super-knowledgable not just about the test but about recommending lifestyle changes to improve your well-being. You should get $10 off if you follow the above link. Yes it's a referral link, and yes, I got a discount for plugging them on my Twitter, but I receive no compensation for this blog post. I think you guys know me well enough to know I wouldn't be writing it if I weren't fully satisfied with what I got. Best of luck in your own fitness goals! Absolutely fascinating Terrence. I'm now 57 and I have been weight-training for just 18 months (after nine years of cardio had merely staved off deterioration). Looking at the photos of you, I would have thought that you were about 8% as well. I am going to seek out a DEXA place in London (UK). I'm sure that my trainer would be interested in the results too. I do my best on diet -- people don't realize how important it is -- but I just don't have your incredible dedication. But going to weight training was perhaps the best thing I ever did in terms of understanding my own body. I guess my main point would be; it doesn't matter how old you are, training of the type you put yourself through will continue to good right the way up to 70 years old and beyond. Please keep up with posts such as this -- fascinating reading. 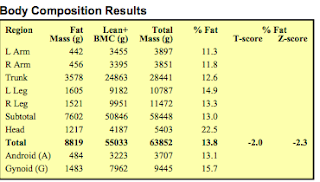 I would have thought thigh fat % would be lower than overall fat %, but I've only found one other DEXA result to compare (his thigh fat % was lower than overall). How much vitamin D are you supplementing? ... No matter the quantity, it's worth testing to see if you're blood level is actually where it needs to be during the winter. That's a really good point. Some people simply don't absorb D very well. Full bloodwork for cholesterol, testosterone, D levels etc would probably be the next thing on my body metrics wish list. I supplement about 4000-5000 IU a day (liquid so it varies a lot) and I eat a very meat/fish/butter heavy diet. Yeah, who knows. Maybe a different machine would yield a different result. Or maybe I just look more lean than I am. Who knows. You have to be under 10%. Im at 10% and your core is more defined that mine. I would say 8 to 10. 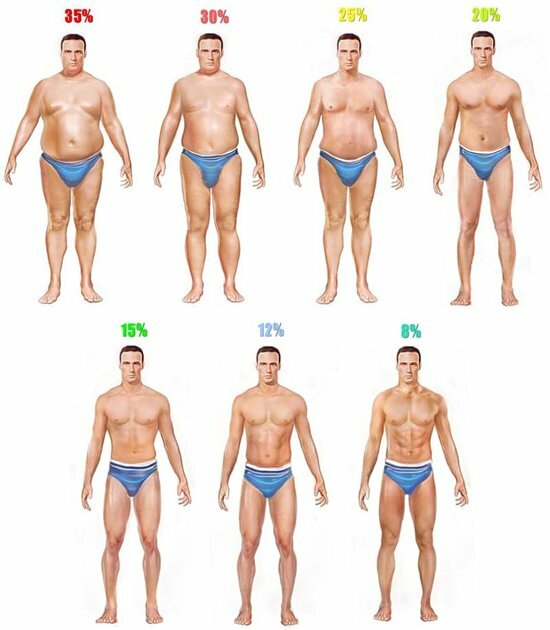 These body fat test can be way of if you as me.